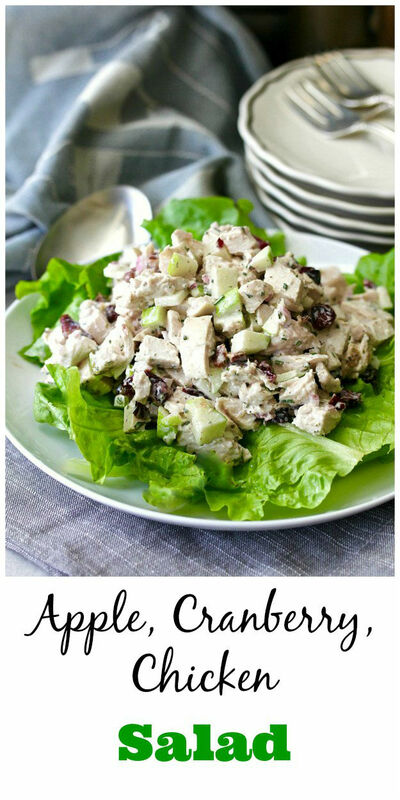 This Chicken Salad with Apples, Cranberries, and Pecans is crunchy, both sweet and sour, and loaded with flavor. This recipe was given to me by my friend and colleague Melanie, who raved about it. I hung onto it for more years than I'd like to admit... there are so many recipes I want to try! I wish I hadn't waited quite so long, because this salad is refreshing and delicious. Two tricks for making this salad extra delicious are roasting bone-in and skin-on chicken breasts (the skin and the bones add flavor and moisture to the meat) and toasting the pecans to really develop their flavor. 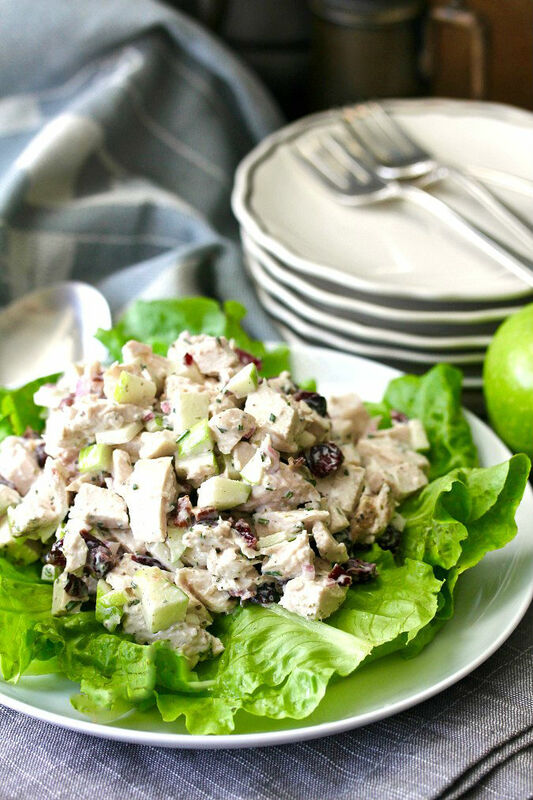 This apple cranberry chicken salad is also very light. The dressing consists of Greek yogurt, light mayonnaise, and apple cider or champagne vinegar. It's loaded with Granny Smith apples and flavored with shallots and minced rosemary. This chicken salad is wonderful served on a bed of lettuce. It's also pretty good as a filling for a chicken salad sandwich. The contrast of the tart apples, the sweet/tart cranberries, and the toasty pecans is very tasty. It tastes way better than it looks. 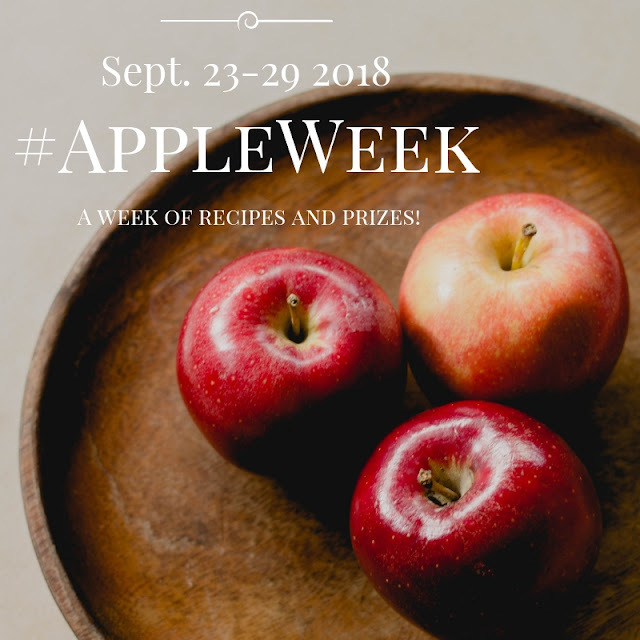 Today is the last day of Apple Week! Thankfully, you have another week to enter to win one of several prizes, including one from Swiss Diamond Cutlery, who gave us this 3.5 inch paring knife, which I used to cut the apples for this salad. I love the heft and feel of this knife. In fact, it's my new favorite paring knife. Swiss Diamond is giving away a fabulous 10-piece set of pans that I would pretty much wrestle you for if I could. I'm sad I can't enter! They are amazing. Check them out in this post. After the recipe, be sure to check out the rest of the Apple Week recipes. And enter here to win!! Heat your oven to 375 degrees F. Rub the chicken breasts with olive oil and sprinkle with salt and pepper. Bake the chicken on a baking sheet for 35 minutes, until cooked through. Set aside to cool. Remove the skin from the chicken. Remove the meat from the bone. Dice or shred the chicken into 1/2 inch cubes. Mix together the Greek yogurt, mayonnaise, vinegar, and rosemary. 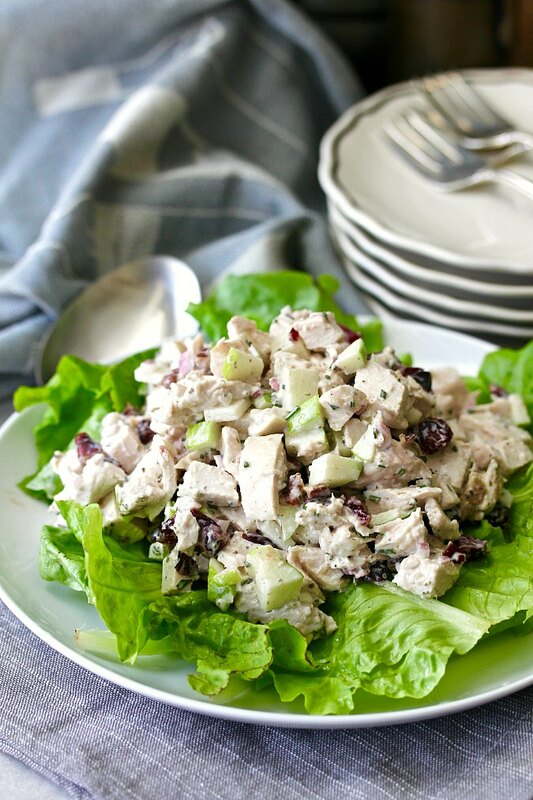 In a large bowl, combine the chicken, pecans, shallots, green apple, and cranberries. Toss with the dressing until combined. Season to taste with salt and pepper. Chill until ready to serve, at least an hour. Love the tip about roasting the chicken with bone and skin on, it's all in the details, isn't it? Oh yes!!! Loved the 2:1 Greek yogurt-mayo ratio with the cider vinegar! And we'd LOVE to see how fresh rosemary pairs with all this. Definitely a delicious winter salad, kudos Karen! The rosemary is mild and works well! I never think to make chicken salad unless I am hosting a baby or bridal shower. This recipe sounds delicious. Love the dressing. I know what you mean! Thanks.